We’d love your help. Let us know what’s wrong with this preview of Operation Frog Effect by Sarah Scheerger. If one small act can create a ripple across the universe . . . what happens when a whole group of kids join together and act? Told in eight perspectives--including one in graphic novel form--Operation Frog Effect is perfect for fans of Andrew Clements, Rob Buyea, and Sarah Weeks, and for anyone who wants to make a difference. It's us, Ms. Graham's class. We didn't mean If one small act can create a ripple across the universe . . . what happens when a whole group of kids join together and act? It's us, Ms. Graham's class. We didn't mean to mess things up. But we did. We took things too far, and now Ms. Graham is in trouble--for something we did. We made a mistake. The question is, can we fix it? Ms. Graham taught us that we get to choose the kind of people we want to be and that a single act can create ripples. So get ready, world--we're about to make some ripples. Everyone makes mistakes. But what happens when your mistake hurts someone else? Told in eight perspectives--including one in graphic novel form, Operation Frog Effect celebrates standing up and standing together, and tells the unforgettable story of how eight very different kids take responsibility for their actions and unite for a cause they all believe in. To ask other readers questions about Operation Frog Effect, please sign up. Have you ever had a teacher that was completely awesome and made a huge impact on your life? At White Oak Elementary School, Ms. Graham is that teacher and the impact is made on eight very different students. Emily doesn't understand why her two best friends, Aviva and Kayley, won't talk or sit with her on the first day of fifth grade. Kayley actually doesn't like Emily and is extremely stuck up. Sharon doesn't seem to have a voice because she always seems to get interrupted and corrected when talking. She also describes herself as weird and a loner. Blake doesn't have many friends and likes to express himself through his drawings. Henry is a big cut-up and wants to be a famous movie writer/director of comedies one day. Kia comes from a big family and the thing he loves to do the most is read. Cecilia has only been at White Oak a year and she misses her Abuelita back in Mexico so much that she writes her letters teaching her English. Lastly, Aviva misses her best friend, Emily, but she has her reasons for dissing her and befriending Kayley. These kids don't always get along but a classroom assignment brings about new friendships and some bitter competition between table groups. However, when one group assignment goes terribly wrong, they all must team together to save themselves and their beloved teacher. Will they be able to come together to save Ms. Graham's job? Will they be able to put their differences aside to get this done? Read this incredible story to find out how this story plays out. This books is so amazing! It is written from eight different perspectives in letter form, including one in graphic novel form. Ms. Graham is an inspirations teacher and the affect she has on her students makes me want to be a better teacher. Do not miss this story of friendship, coming of age, and how powerful students voices truly can be. Operation Frog Effect is a story told in journal form–with eight (diverse) kids who are writing their experiences as the school year progresses. The kids use multiple formats. For instance, one writes mostly in verse while another does his journaling in graphic novel format. These different formats are sure to appeal to a wide variety of readers. Right from the start, I could tell that the characters were going to be incredibly relatable: the story starts with Emily, who’s confused by the fact th Operation Frog Effect is a story told in journal form–with eight (diverse) kids who are writing their experiences as the school year progresses. The kids use multiple formats. For instance, one writes mostly in verse while another does his journaling in graphic novel format. These different formats are sure to appeal to a wide variety of readers. Right from the start, I could tell that the characters were going to be incredibly relatable: the story starts with Emily, who’s confused by the fact that her two best friends didn’t sit with her on the first day of school. She’s sure it’s a mistake. Well, pretty sure. That beginning set just the right tone and let me know that this book was going to tug at my heartstrings and address situations that middle school kids face every day. It also tackles some tougher topics as well, like learning disabilities, immigration and homelessness. The fact that these issues are handled in the midst of problems that almost all kids can relate to makes them that much more accessible. Throughout the book, the kids learn how they can make a difference in the world, one small step at a time. But, as kids often do, they make some mistakes along the way–and one of their mistakes has some pretty major repercussions. The kids have to live with some of those consequences–and to fight to make things right. Kids will find the ending both inspiring and empowering! This book will especially appeal to the younger end of the MG spectrum (not that older kids can’t enjoy it too–it just seems aimed a little younger). It would be perfect for a classroom or as a readalong with your kids because it will spark lots of discussion! Ms. Graham's fifth grade class is an exciting place to be. She lets the students help form classroom rules and homework policy, they work in groups, and there is even a class pet, Kermit. The students are also keeping journals, and we hear from the perspective of eight of them. Blake likes to draw his entries, and he and his mother struggle with housing and other issues. Aviva's mother is in the country without proper papers, and both miss Aviva's grandmother in Mexico. Emily is struggling with the fact that her two best friends are going to another school next year, and there is no way her mother can afford to send her there. Henry wants to be a movie director, so creates scripts for his entries. There are a lot of projects, and Ms. Graham includes a lot of social justice issues in her class. When a group decides to visit a homeless encampment without permission, many people get in trouble, and Ms. Graham is in danger of losing her job until the children are able to make the powers that be listen to their explanation. Strengths: This is exactly on trend with its themes of social and emotional education. Ms. Graham is an engaging teacher, and her students are generally excited about learning, which is a good example to see in literature. The characters are all well defined, and the plot moves along nicely. Weaknesses: There are quite a lot of social concerns included in this book. While this is quite common currently, I think it confuses young readers to have to deal with so many. And not so much a weakness as an observation: I'm trying to determine what it is that makes certain books set in elementary school unpopular with my readers, while others are fine. Sadly, class pets seem to be a big dividing factor, and the cartoon style on the cover makes this seem a bit young to my students. Oh, wow. Seriously. That's pretty much the extent of my ability to actually review this book right now, because I am so gosh darn impressed with it. Have you been burning to read a book from the perspective of an amazing class of 5th graders, that will leave you wanting to be a better person at the end of it? Well, welcome to that book. I've stated before how much I love when authors don't talk down to this age group of readers, and how important it is to treat them with respect. Sarah Sheerger Oh, wow. Seriously. That's pretty much the extent of my ability to actually review this book right now, because I am so gosh darn impressed with it. Have you been burning to read a book from the perspective of an amazing class of 5th graders, that will leave you wanting to be a better person at the end of it? Well, welcome to that book. I've stated before how much I love when authors don't talk down to this age group of readers, and how important it is to treat them with respect. Sarah Sheerger does that, and more. This book is full of real life issues, seen through the eyes of the children living them. It's a beautiful, beautiful thing. Prepare for some gushing. First off, I have so much love for the way that this story is told. Ms. Graham's class is spending the year journaling and writing one another letters, so this story is a compilation of those musings. What I loved though, was that Sheerger really channeled the kids and their personalities. Some wrote in poems, some in perfectly written letters, and one in wonderful mini comic form. Each of the students had their own perfectly formed quirks, and they shone through their writing. Getting to know them was a lot of fun, and watching them interact with one another while growing was fantastic! As I mentioned above, this book is also packed to the brim with all kinds of wonderful messages. These kids are truly amazing. With the help of their teacher, they learn to find their true passions and speak out for what they believe in. I smiled as I watched them research social issues, and truly discuss them like adults. My eyes misted over when the class did a social experiment to go along with learning about Anne Frank, and the kids actually learned something from it. I can't say enough about how well this book tackles everything from immigration to rough home lives. There will be so many young readers who will finally get to see themselves, and issues that are very real to them, depicted on the page. It makes me teary eyed just thinking about it. Long story short, this is a stellar read. I recommend that it be put into the hands of every young reader out there, and discussed in classes or at home. There is so much in this book that our young people really need, and I can't gush enough. Pick this up, and share it with others. Have you ever had a teacher that was completely awesome and made a huge impact on your life? At White Oak Elementary School, Ms. Graham is that teacher and the impact is made on eight very different students. Emily doesn't understand why her two best friends, Aviva and Kayley, won't talk or sit with her on the first day of fifth grade. Kayley actually doesn't like Emily and is extremely stuck up. Sharon doesn't seem to have a voice because she always seems to get interrupted and corrected when t Have you ever had a teacher that was completely awesome and made a huge impact on your life? At White Oak Elementary School, Ms. Graham is that teacher and the impact is made on eight very different students. Emily doesn't understand why her two best friends, Aviva and Kayley, won't talk or sit with her on the first day of fifth grade. Kayley actually doesn't like Emily and is extremely stuck up. Sharon doesn't seem to have a voice because she always seems to get interrupted and corrected when talking. She also describes herself as weird and a loner. Blake doesn't have many friends and likes to express himself through his drawings. Henry is a big cut-up and wants to be a famous movie writer/director of comedies one day. Kia comes from a big family and the thing he loves to do the most is read. Cecilia has only been at White Oak a year and she misses her Abuelita back in Mexico so much that she writes her letters teaching her English. Lastly, Aviva misses her best friend, Emily, but she has her reasons for dissing her and befriending Kayley. These kids don't always get along but a classroom assignment brings about new friendships and some bitter competition between table groups. However, when one group assignment goes terribly wrong, they all must team together to save themselves and their beloved teacher. Will they be able to come together to save Ms. Graham's job? Will they be able to put their differences aside to get this done? Read this incredible story to find out how this story plays out. Can I just say how much I love this book? I can’t wait to add OPERATION FROG EFFECT to my classroom library because I know it will be a big hit with my middle school students. If your kiddo, tween, or teen is a fan of big-hearted books like WONDER and also enjoys the fun of the WIMPY KID books, then this is the perfect combo! 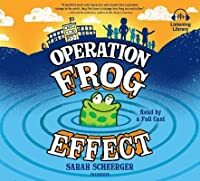 OPERATION FROG EFFECT by Sarah Scheerger addresses many difficult issues, but in a light-hearted format and in a manner in which kids can relate. Through letters, graphic n Can I just say how much I love this book? I can’t wait to add OPERATION FROG EFFECT to my classroom library because I know it will be a big hit with my middle school students. If your kiddo, tween, or teen is a fan of big-hearted books like WONDER and also enjoys the fun of the WIMPY KID books, then this is the perfect combo! When I read for a frontlist order, I often skim and then skim again and read the first and last chapter and MAYBE work my way backwards (I know, weird) until I get the gist. But this one has me smitten, mostly because I’m a sucker for stories of inspiring teachers, but I also loved how well realized the eight fifth graders at the core of this story were. It’s hard to give so many characters distinct personalities but this one nailed it. This is the kind of book I’ll save for Adam t Soooooo cute. When their teacher explains the Butterfly Effect, “It’s the idea that a small change in one thing can lead to big changes in other things…Anything and everything we do—positive or negative, big or small—can influence other people and the world.” (153, 155) and tasks her 5th graders to think about what they could do within their social-issues projects to make a difference, they do—with repercussions they did not imagine. Told through their daily journals, readers learn about the lives and feelings When their teacher explains the Butterfly Effect, “It’s the idea that a small change in one thing can lead to big changes in other things…Anything and everything we do—positive or negative, big or small—can influence other people and the world.” (153, 155) and tasks her 5th graders to think about what they could do within their social-issues projects to make a difference, they do—with repercussions they did not imagine. Thank you to @kidlitexchange and the publisher for the free review copy of this book. All opinions are my own. It’s the first day of fifth grade and the kids in Miss Graham’s room are feeling hopeful and quite pleased with themselves, because they’re the top kids at White Oak Elementary. They’re seated at tables of four. Some are with their friends, and of course some are not; it was just an empty chair. Some are happy with their table mates, and some are quite annoyed; especially when they learn Thank you to @kidlitexchange and the publisher for the free review copy of this book. All opinions are my own. It’s the first day of fifth grade and the kids in Miss Graham’s room are feeling hopeful and quite pleased with themselves, because they’re the top kids at White Oak Elementary. They’re seated at tables of four. Some are with their friends, and of course some are not; it was just an empty chair. Some are happy with their table mates, and some are quite annoyed; especially when they learn these places are their seats for the year!! We quickly meet eight of them. They’re an assorted bunch; lots of ethnicities, lots of different home lifes. Some are bossy, some are quiet, some are trying to find a place to live after being evicted, some are dealing with parental depression, some are trying to avoid deportation, some have been friends since kindergarten and some really don’t know each other at all. What they do have are preconceived ideas and expectations about one another. But each of them have strengths they soon discover about themselves and about one another, thanks to Miss Graham’s creative lessons. They learn to be leaders, to be creative problem solvers and to think for themselves. And most importantly she teaches them about “the butterfly effect”, which they quickly paraphrase as “the frog effect” in honor of their class frog. These strengths come in handy later in the year when they find their teacher falsely accused and placed on leave. As a teacher, Miss Graham’s innovative methods were very inspiring to me. I wanted to be part of the class as they discovered much about the world, about each other and about themselves. I wanted to join in as they created ripples in their community to help make the world bit of a better place. I loved the way each of them grew throughout the year, which led to them forging friendships and learning how support one another. I laughed, I cried and I cheered as I flew through the story. This book will be inspiring to all who read it. It will make you ask, “how can I make some ripples to help those in my world?” This perfect MG book, due to be released 2.26.19, is told completely through the journal entries of the eight students. It needs to be on the shelves of all elementary and middle school libraries. Thank you @kidlitexchange for the review copy of Operation Frog Effect. This book released in February, 2019. All opinions are my own. When you have a teacher who thinks “outside the box,” it can bring new life and energy into a classroom. That is exactly what happened in Ms. Graham’s class. When Ms. Graham introduces new projects and requires all of her students to have a journal, it opens them up to share their ideas in new ways. We learn all about what is happening in the story through the unique journal entries of Emily, Kai, Sharon, Henry, Aviva, Kayley, Blake, and Cecilia. Each child comes from a different background, and tells us what is happening from their perspective. While working on group service projects, one group takes things way too far in their quest to get a first hand experience. This has serious consequences for them and Ms. Graham. The children must find a way to use their voices and come together to be heard, make a difference, and help their teacher. I love the format of this book. It was interesting to see the different children's perspectives on Ms. Graham and the new ideas she introduced in class. I loved the different formats of the journal entries, from Blake’s drawings, Sharon’s entries in verse, Cecilia’s letters to her Abuelita, Henry’s “scenes,” Kai’s letters to Kermit, and the other letters. There are a lot of friendship issues that many children will be able to identify with. There are also other important issues, such as Blake’s family losing their apartment, and Cecilia dealing with her mom being an illegal immigrant. While some children will be able to identify with these topics, they will be very eye opening for others. I really enjoyed how the children came together in the end and used their voices to stand up for what they believed it to help their teacher. The children learned valuable lessons about friendship, helping others, and changing the world. Sarah Scheerger writes a marvelous novel following a group of kids in a 5th grade classroom. They are bonded together by a really amazing teacher who uses some unusual teaching methods to help them see the world better and to understand that every little thing they do has an impact, good or bad, just like the flap of a butterfly wing. When they are thrown together into two groups of four and then one large group of eight, they realize how important it is to work together and to respect that what Sarah Scheerger writes a marvelous novel following a group of kids in a 5th grade classroom. They are bonded together by a really amazing teacher who uses some unusual teaching methods to help them see the world better and to understand that every little thing they do has an impact, good or bad, just like the flap of a butterfly wing. When they are thrown together into two groups of four and then one large group of eight, they realize how important it is to work together and to respect that what makes someone different makes them special. This is a great book to have in school libraries as a way to teach perspective and teamwork to kids. The story is told through the journal entries that 8 kids are writing throughout the year. Emily doesn’t understand why Aviva and Kayley aren’t talking to her anymore. Aviva isn’t able to stand up for herself. Kayley is the mean girl who thinks too highly of herself. Sharon writes everything in verse and feels that no one listens to her or notices that she is there. Cecilia is writing to her Abuelita back in Mexico. Blake only draws his entries, he never writes. Henry wants to be a big time movie director and is always trying to make people laugh. Kia is often lost in a book, he can even mop the floor and read at the same time (don’t ask him how). Operation Frog Effect is about a group of students and an extraordinary teacher who used a bit of ‘out of the box’ teaching methods to get her students to think about real life situations. One of her projects was about social issues and the students who were put in groups had to decide on a issue then think of how they could change things. One such group decided on the homeless and when the teacher told them they should ‘immerse themselves’ into their issue they did something not so great which r Operation Frog Effect is about a group of students and an extraordinary teacher who used a bit of ‘out of the box’ teaching methods to get her students to think about real life situations. One of her projects was about social issues and the students who were put in groups had to decide on a issue then think of how they could change things. One such group decided on the homeless and when the teacher told them they should ‘immerse themselves’ into their issue they did something not so great which results in getting the teacher into trouble. The students took what the teacher taught them to make their voices be heard. It’s told in a mix media style told in the POV of seven different students who come from a wide variety of backgrounds and home situations. Through their journal entries and their different styles of writing you get to know about their situation and of everything else that is going on. I might not have agreed with some things because of my own personal beliefs but I still enjoyed the book and it’s message. “Operation Frog Effect,” by Sarah Scheerger, is among the very best of middle grade fiction. Told through the perspective of eight fifth graders as they write in their class journals, this is the kind of book that fills you with optimism for the future and encourages you to strive to be a better person. 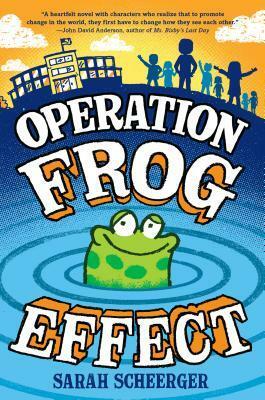 Ms. Graham has a creative way of running her classroom and teaching her students, through her innovative education philosophy her students learn the power of friendship, and standing up and takin “Operation Frog Effect,” by Sarah Scheerger, is among the very best of middle grade fiction. Told through the perspective of eight fifth graders as they write in their class journals, this is the kind of book that fills you with optimism for the future and encourages you to strive to be a better person. Ms. Graham has a creative way of running her classroom and teaching her students, through her innovative education philosophy her students learn the power of friendship, and standing up and taking action for what they believe in. Each of the eight diverse students is struggling in their own way and the way they come together had me cheering. I promise you will LOVE this book! Recommended for ages 8-12 (although I think it would be best for 4th-6th grade), you can pick this book up when it hits shelves on February 26, 2019. Thanks to @randomhousekids for sharing this book with #kidlitexchange and thanks to the @kidlitexchange network for the review copy of this book – all opinions are my own. It’s clever and smart and creative in every way. Inspiring for all ages. Operation Frog Effect, by Sarah Scheerger (https://www.sarahlynnbooks.com/) is a beautiful portrayal of young hearts and minds trying their best to cope with life’s problems and do the right thing when faced with hard choices. The novel is a “novel” look into the private thoughts of eight young students in a progressive classroom who are torn by conflicting friendships and rivalries. Each of these bright young people must o It’s clever and smart and creative in every way. Inspiring for all ages. Operation Frog Effect, by Sarah Scheerger (https://www.sarahlynnbooks.com/) is a beautiful portrayal of young hearts and minds trying their best to cope with life’s problems and do the right thing when faced with hard choices. The novel is a “novel” look into the private thoughts of eight young students in a progressive classroom who are torn by conflicting friendships and rivalries. Each of these bright young people must overcome their self-concerns, along with family issues, to forge a cooperative culture in which together they can learn, solve problems, and even make a positive difference in their school district. With deep insight into adolescent psychology, Scheerger has created a sweet, enriching surprise for any middle grade reader who sits down on the family room couch, puts their feet up on the coffee table, opens the colorful cover of Operation Frog Effect, and beholds the story that leaps from its amazing pages. I love frogs. I don't know what it is, but their cute, wide faces get me every time. Which means as soon as I saw the cover to "Operation Frog Effect" it was love at first sight (yes, I judged a book by its cover). But after reading the book, I can safely say that it was even better than I had anticipated. It is told by a steady rotation of narrators, each with its own distinct personality and writing style, who give one piece of the larger puzzle that is Ms. Graham's fifth grade classroom. Much I love frogs. I don't know what it is, but their cute, wide faces get me every time. Which means as soon as I saw the cover to "Operation Frog Effect" it was love at first sight (yes, I judged a book by its cover). But after reading the book, I can safely say that it was even better than I had anticipated. It is told by a steady rotation of narrators, each with its own distinct personality and writing style, who give one piece of the larger puzzle that is Ms. Graham's fifth grade classroom. Much like our own students, these kids are trying to figure out how they fit into the world, and how they fit with one another. It takes a much larger problem for them to realize how they fit best - together as a group. It's a heartwarming tale that, with its distinct writing format, will pull in the most reluctant of readers. I'd recommend for kids in grades 3 through 6th. I started reading this book because it's by a local author - but I finished it within a day because of the amazing message and the incredible storytelling. The style of this novel is incredible and unique - eight diverse perspectives in journal format, with one additionally in graphic novel format and another in verse. The message is to stand up for what you believe in. There are references to so many amazing children's books and I just loved this book so much. I'd been reading about this book - but put it off until I realized Gina Perry had done the inside illustrations. I got it write away and read it yesterday. I totally enjoyed it and wonder what my students and what any middle grade reader will feel when they find so many of their classmates captured within the pages. On top of that, I'd like to be brave enough to channel a little Ms. Graham into my teaching. I'll be looking for more Sara Scheerger books for sure! With this beautiful book, filled with rich characters, Sarah has reminded us what matters most. The journal-writing style provides the reader with the opportunity to truly hear all of these unique voices in a meaningful way. In a world fraught with divisiveness and distress, this book is a breath of beautiful, realistic, wonderful fresh air. I highly recommend this book. I loved this book! It took me right back to elementary school. So many personalities and backgrounds all together in one classroom. I loved how the story was told in journal entries. It's a master class on voice. This teacher is brilliant. I love her non-traditional teaching techniques. She really taught her class how to use their brains and their hearts to solve problems. OPERATION FROG EFFECT has something for every MG reader. The multiple narrators use a variety of writing styles to tell this thought provoking story. I love how this book shows young people that they can make a difference. This book will be enjoyed by middle grade readers. A realistic fiction story that is told in multiple voices from students in a classroom and in a journal format - social justice issues are lightly explored and discussed. Perfect for readers who enjoyed BECAUSE OF MR. TERUPT. This is such a sweet and important book, with well-drawn out and distinct characters and a heartfelt plot. I loved it from the beginning, and now my eleven-year-old son LOVES it, too--so much that he's asked for a sequel! This was a fantastic middle grade book reminiscent of Mr. Terupt and Ms. Bixby that will inspire 4th-5th graders especially to make a difference in the world around them and jn their community and school especially... I expect to see this on many state book lists! A feel-good story of a fifth grade class coming together to save their teacher's job and making other changes in their community. It reminded me of the Mr. Terupt series. This wonderful story is told through journal entries of 8 students in Mrs. Graham's class. The students have different writing styles. One is even writes in cartoon form. Mrs. Graham is a master at teaching social issues. As the students struggle to get along, appreciate each other and contribute to the class they are forced to come together for a big cause. Fans of Rob Buyea's Perfect Score will love this book.